This new edition continues to provide a fascinating account of the plague that ravaged the world in the fourteenth century. An updated introduction provides important background information and addresses the “plague denial” controversy. A new section of documents on environmental explanations for and responses to the plague joins sections on the origin and spread of the illness; the responses of medical practitioners; the societal and economic impact; religious responses; the flagellant movement and attacks on Jews provoked by the plague; and the artistic response. Documents from many countries — including Muslim and Byzantine sources — give students a variety of perspectives on this devastating illness and its consequences. In addition to the new environmental sources, new documents include a “Middle Dutch Flagellant Scroll,” here printed in English for the first time; German letters to the town of Strasbourg on their pogroms against the Jews; Ibn Khātima’s medical description of plague symptoms and transmission; and artistic depictions of the plague saints, Sebastian and Roch. 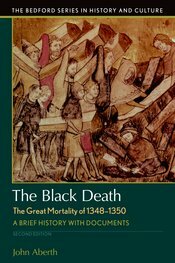 The volume also includes document headnotes, a chronology of the Black Death, Questions for Consideration, a selected bibliography, and an index.